Chickens and vegetable gardens were part of my childhood before I can remember. Much like the rest of a farm, they spark pleasant, subconscious memories. Once the backyard garden was sorted, chickens were next. In February of this year, I started researching chickens and finding coop inspiration. J and I decided early on that we wanted to build our own coop, and we collaborated on a digital model to figure out the construction and estimate materials. Work in progress coop design in Sketchup. 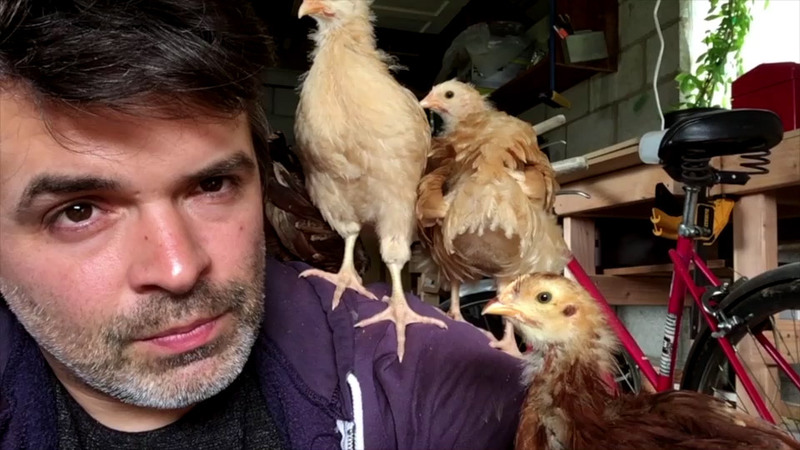 We started construction in the last week of February with the goal of finishing before we acquired the chicks and set up their brooding pen in the garage. Too much information about raising chickens is available on the internet, so we read enough to make sure we didn’t mess up immediately. Our coop was a cube with a pointed roof, raised off the ground on four posts so the chickens had outdoor shade and rain shelter. Inside, there were two roosting boards, a PVC feeding pipe, and plenty of upper ventilation. I originally made a removable nesting box with four cubbies, but decided to rebuild it into two cubbies. Waiting for the finished siding. Two walls and the roof were clad with chipboard, plastic sheeting, and wrapped with expensive cedar tongue and groove siding. The other two walls were painted plywood. We cut a double door for easy access from the outside and a small chicken size opening leading to the run. For predator protection, we extended hardware cloth along the bottom edges and into the ground. By mid March, we had mostly finished the coop, but still needed to build the run. But J and I could no longer wait. 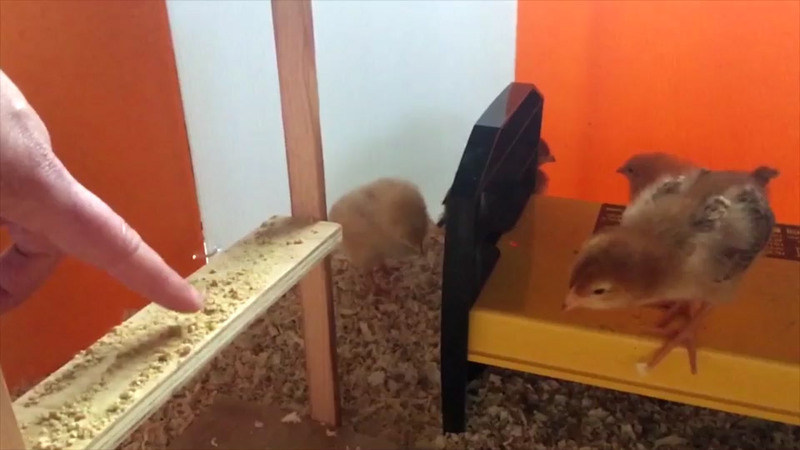 We got four chicks from our nearest feed store: two Rhode Island Reds and Two Buff Orpingtons. They were all under a week old and around $3.50 each. They came home in a glorified food takeout box. My father had sent most of what we needed for a brooding area: a plastic pen, pine shavings, starter food, a small feeder and a waterer. I added a low energy contact brooding heater that was significantly safer and cheaper to operate than a heat lamp. Holding Buffy they day we brought her home. She wouldn’t stay this small for long. 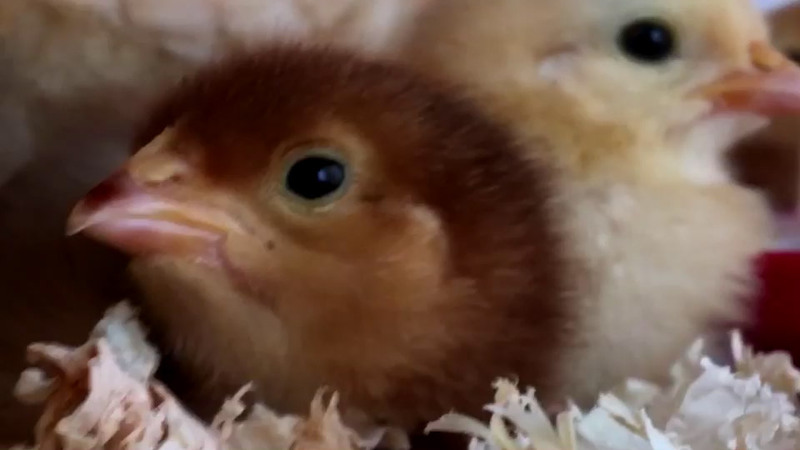 The chicks huddled together in their first moments in the brooding pen. J and I checked on the chicks at least twice a day, refilling their food and water and scooping droppings. We handled the birds as much as possible, but they still preferred to jump up onto us on their own and use our arms and shoulders as roosts. It was shocking how much the chicks ate (5 pounds of feed a week) and how quickly they grew. By the week (and often by the day) they seemed noticeably bigger and more feathered. To keep them from getting bored, I made a wooden platform on a stool above the pen they could jump to. A halogen work light provided a supervised blast of heat that they enjoyed lying near. Their first moment in the brooding pen. All four roosting on their father. While the chickens stayed warm in the garage, we finished up the run. Comprised of two more pairs 4×4 posts and connecting 2x4s, the structure was painted and wrapped with hardware cloth. Another set of double doors provided easy access to the watering bucket and exterior food tube. Once the run was finished, I completed the doors and remaining finishing details on the coop. The start of their awkward looking age. 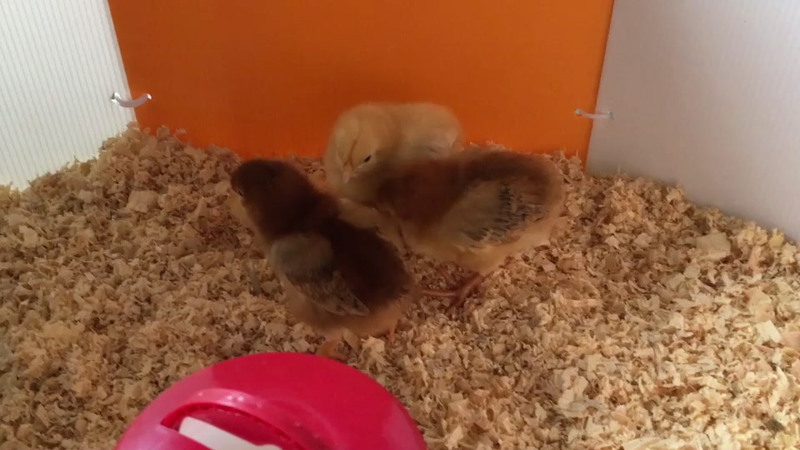 The chicks remained unnamed while in the garage, though they had nicknames. The finished coop from the run side. By the end of April, the ladies were both almost fully feathered and too big for the garage pen. We brought them out to the run once, but it was a cold and windy day and they seemed more scared than excited. On a sunny weekend day, we put bedding in the coop and J moved them outside two by two on her shoulders. We sat with them inside the run, the only moment that it would be grassy and poop-free. You could tell they were going to enjoy their new home. The ladies first taste of “outside”. J shuttling the chickens to the coop. Getting introduced to their new home. Hanging out in the new digs. The first night, they went inside the coop and jumped up to the roosting perches on their own. It was time to name them: Buffy the Orpington, Runty(Rose), Cocoa, and Repecca. Most of them just kept their nicknames. In less than a month, the chickens stripped the run to bare earth. I could see that they were getting bored being cooped up (pun intended), but I was too fearful to let me roam freely in the yard. As a compromise, I built a small chicken tractor out of scrap wood and chicken wire I found in the basement. It wasn’t anything fancy, but it at least let them safely get out onto fresh grass. Later, I added some bracing and casters to make it easier to move around. For added predator protection to the coop and run, we dug out along the sides and ran hardware cloth parallel to the ground since tree roots kept us from going deeper. G watches his new yard companions with curiosity. Finished coop and the start of spring gardening. The chickens grew too big for the tractor, so I bought some green plastic fencing and metal poles and installed a 3 foot tall fenced pen that connected to the run. Being open on top meant that both cats and hawks could get in if they wanted to, so it was only used while I was at home. Dirt bath outside the run. The chickens loved the extra room to run around. Plus, I had room to sit and spend time with them and not feel like a rat in a cage. From their fenced part of the yard, the chickens could see a whole world of plants and bugs to investigate. Buffy and Repecca started jumping the fence and exploring the yard. At first I tried to put them back, but most of the time they would immediately escape again. So I started letting them out into the entire backyard while keeping an eye on them from my office window. 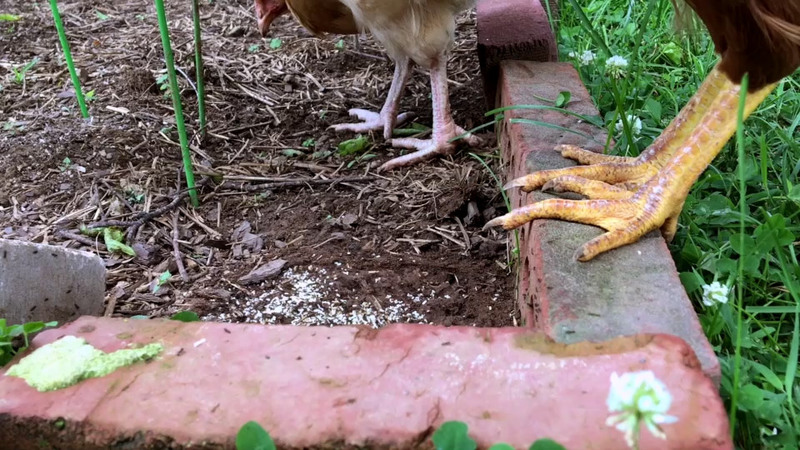 The chickens have only been mildly destructive to the garden by eating a few greens, picking tomatoes, breaking squash and watermelon vines, and exposing roots when digging their dust baths. On the plus side, they’re eating a lot of bugs and fertilizing the lawn. Free ranging amongst the squash. A test of free ranging. During the hottest part of the day, the chickens stick to the shade and rest in the dust baths under the poke weed, okra, or lemongrass. Despite our cat, two neighborhood cats, a variety of neighborhood hawks, and evidence of possums and raccoons, the chickens haven’t had any issues while free ranging. There is always the risk something horrible will happen back there, but now that they’ve seen freedom it would be cruel to take it away. When I leave home for more than an hour, I make sure to lock them up again. 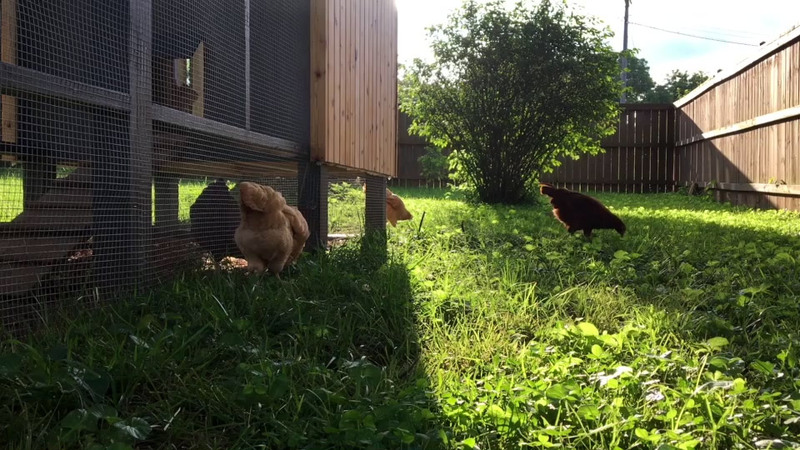 And they return to the coop at sunset on their own. I just have to secure the doors. J and I are more attentive to our flock that necessary, especially since I work from home. Before breakfast, J changes their water, tops off their food, and cleans droppings from under the roosts. If I’m working from home, she lets them into the backyard. After J leaves for work, I go out to check on them and give them either food scraps or dried mealworms as a snack. I inspect the garden for any changes, and offer ripe tomatoes to the excited takers. Free ranging amongst the herbs. Time permitting, I check on them a few times during the day. I’m building up a tolerance to mosquitoes. We each have our chicken tending shirts and clogs to keep the house from getting contaminated. In the first week of August, we got out first egg! Our first egg in the nesting box. It was a perfectly clean, medium sized treasure laid in the late morning by our smallest buff orpington. Not long after, we had our second egg per day. Then our third. As expected, they are delicious: smooth texture, full flavor, and fresh. Even three eggs a day is almost two dozen eggs a week, so we’ve been giving them away when possible. It took a month longer for our boldest and most developed Rhode Island Red to lay her first egg. There were five eggs in the coop that day, so maybe she was saving up? 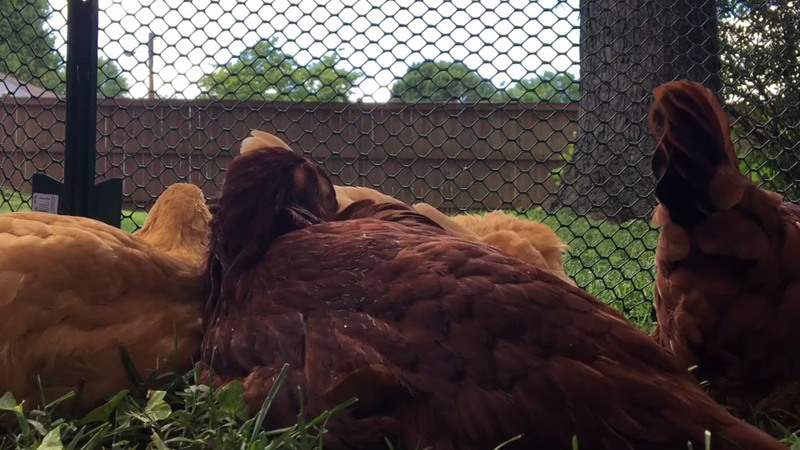 The chickens all lay between 9am and noon, and they prefer to share the bottom nesting box. 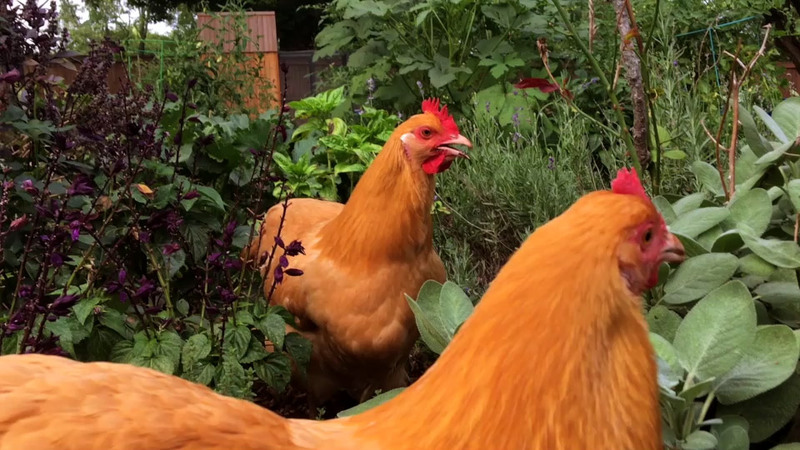 Our chickens could live for a decade, if not longer. Even though their egg production will slow down, that’s a lot of eggs. I love our chickens, and the feeling grows by the day. I’m horrible about making plans for the future, but at least I know I’ll be getting plenty of cholesterol.